The U.S. Army is looking for a new vehicle to quickly transport troops across the battlefield. Qualified applicants must carry nine fully-armed infantry soldiers, work after being pushed out of an airplane, and enjoy a road speed of 55 mph. And no armor either. Wait, what? The Army recently released a market survey for what it’s calling the Infantry Squad Vehicle, or ISV. The ISV is meant to be an ultra-light vehicle capable of hauling troops across the battlefield. Unlike other vehicles, the ISV is merely a people hauler and won’t actually do any fighting. Still, the emphasis on light weight and mobility—at the expense of any sort of protection—is sort of an eyebrow-raiser. M2A3 Bradley Infantry Fighting Vehicle. The Army has several ways to move infantry soldiers in wartime. At the high end of warfare soldiers are transported in M2A3 Bradley infantry fighting vehicles (IFVs). Bradleys are designed to carry six soldiers across a violent, fast-moving mechanized battlefield filled with tanks, missiles, and artillery strikes, where dismounting the troops would only slow an attack down. Bradleys are armored enough to protect soldiers from artillery, light automatic cannon and machine gun fire. At the next level down soldiers in Stryker brigade combat teams ride in Stryker interim armored vehicles. Faster moving but with less protection than a Bradley, Strykers can transport up to nine soldiers meant to dismount before the battle in order to fight. Strykers are less well armored, only able to reliably protect their occupants from heavy machine gun and rocket-propelled grenade fire. A Green Beret on a ATV assigned to the 1st Special Forces Group (Airborne) trains with a Stryker Interim Armored Vehicle from 2nd Stryker Brigade Combat Team. The next level down is where the new Infantry Squad Vehicle comes in. After 9/11, U.S. special operations forces pioneered the use of all-terrain recreational vehicles in Afghanistan. ATVs offered rapid movement across cross-country terrain but, being civilian vehicles, offered no protection from hostile fire. 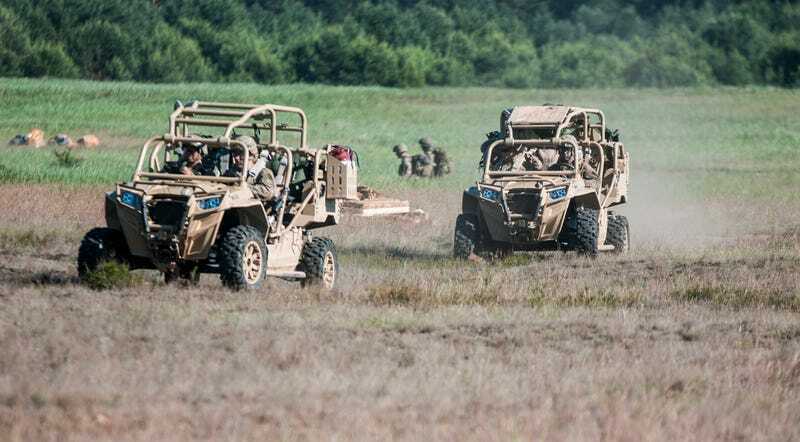 The Army expanded their use by purchasing Polaris Defense MRZR all-terrain vehicles, each of which could carry four soldiers and mounted a heavy machine gun, for trials with the 82nd Airborne Division. Now Army wants an even bigger vehicle capable of carrying a nine person airborne or light infantry squad. The Army defines the ISV as a “lightweight, high mobility platform” transportable both by a UH-60 Blackhawk or CH-47 Chinook helicopter and a low-velocity airdrop—basically being parachuted from a C-130 or C-17 transport. The maximum vehicle curb weight must be no more than 4,800 pounds, plus nine fully equipped soldiers, which the Army reckons weights another 3,200 pounds, for a totally fully loaded weight of four tons. MRZR ATV dropping from a C-17 transport. The ISV is all about mobility, mobility, mobility. Previously, if paratroopers, light infantry or air assault troops wanted to quickly secure their objective they needed to land close by—and become a target for guns and surface-to-air missiles. So-called “light fighters” equipped with ISVs complicate the enemy’s defense. A unit of paratroopers could embark on a C-17 transport in the United States, fly thousands of miles and drop at multiple locations miles their objective, converging on it from all directions. A Blackhawk medium transport helicopter could carry the ISV as a slung load underneath with the nine soldier squad riding inside the cabin. In both cases soldiers can land miles from the objective, drive most of the way there, and dismount to attack. This makes it more difficult for the enemy to locate and counter them. If troops must land within a quarter mile of the objective to attack, the enemy must consider defending a circle with an area of .196 miles. 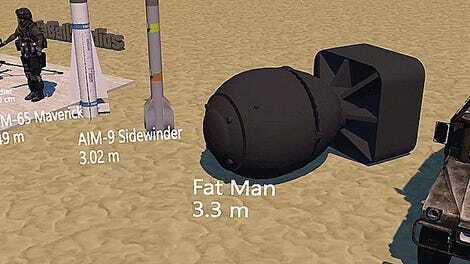 If troops can land up to 20 miles away and then assault over land, that explodes into a circle of 1,256 square miles. 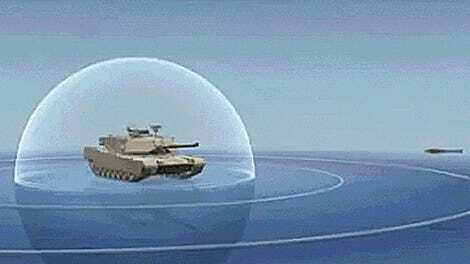 The problem with the ISV is that there is zero protection for the soldiers riding in it. The market survey describes the ISV as “a lightweight, highly mobile open cab vehicle” in which “survivability will be achieved through high mobility, a roll cage and occupant restraints.” Notice the total lack of any protection from artillery shrapnel, missiles, and gunfire, let alone new threats such as improvised explosive devices buried in the ground. Not even a sandwich board protects troops from hostile fire. The Army has been here before. In the 1980s, the 9th Infantry Division was designated a High Technology Light Division (HTLD) with the mission of testing new concepts in mobility and firepower. Like the movie Megaforce, 9th Infantry Division troops rode around in dune buggies armed with TOW anti-tank missile launchers and machine guns similar to line of “G.I. Joe” toys, leading to the affectionate nickname the “Toys-R-Us Division”. Despite the nickname the 9th Division had a deadly serious mission: deploy quickly abroad and kill enemy tanks. Although a bold idea for its time, the 9th Division ultimately failed. The division could travel could travel light and hit hard but ultimately proved to have a glass jaw. Tanks and armored vehicles were simply better protected and could outlast unarmored dune buggies, and the division took horrendous losses from simulated artillery. Polaris MRZR vehicles in Poland, 2016. Will the ISV work? Possibly yes, but only as long as it is used correctly. The mistake the 9th Division made was in fighting from their vehicles, not using their vehicles as taxis to drive to the fight. Troops with ISVs, on the other hand, will dismount from their vehicles and burrow into the landscape, whether it be cities, forests, or other rough terrain. Nine soldiers riding in an ISV is an infantry squad neatly packaged for destruction, but nine soldiers dismounted and fighting on foot are much harder to kill. The Army’s market survey reckons the service could eventually buy up to 2,065 ISVs, with low rate production from 2020 to 2024 and then 261 vehicles a year after that. That’s about enough for every airborne, air assault, and light infantry squad to ride to battle—but not into battle. So if you’ve got a vehicle that could fit the bill, respond by October 26, 2018—and the Army wants you to be sure your proposal is in 12 point Times New Roman font.